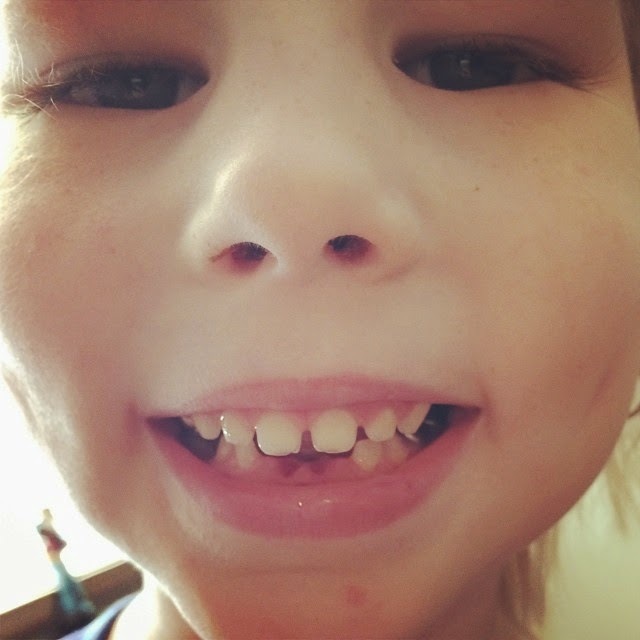 Homeschooling Mom of Four: First Teeth! Sarah's bottom two teeth have been loose for a while now and on Friday I could see that they were hardly attached. I knew they had to come out and I didn't want them to get swallowed because I felt Sarah shouldn't just have them disappear. I thought trying to explain that they were in her tummy would be more traumatic than taking them out myself. Well, she cried, in fact fought it terribly, but I won this one! She recovered quickly and when asked how she felt, she replied with "Happy!" I had told her that when they came out I'd take her to the store for a treat. When I asked her if she wanted to go out, she only asked for chocolate chips. Since she has no concept of the "tooth fairy" or money, this was an easy exchange - teeth for chocolate chips!